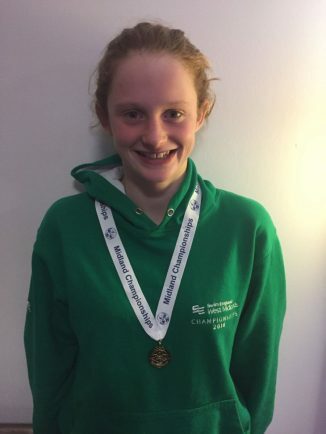 REDDITCH Swimming Club’s Emily Farr enjoyed a hugely successful weekend as she was crowned a junior champion at the Midlands Winter Short Course Championships. Having qualified for four events in the 15 and under junior age group, despite still only being 13, Farr got her weekend off to a fantastic start by becoming the junior champion in the 50m breaststroke in a new personal best time of 34.53 seconds. On the second day of competition in Nottingham, Farr continued to demonstrate her excellent form with new personal bests in the 100m individual medley and 100m and 200m breaststroke as she finished among the top 15 juniors in each event. Redditch SC head coach Chris Britt said: “Emily has shown tremendous progress over the past year and she should be very proud of her performances in Nottingham, especially her achievement in becoming the Midlands junior champion in the 50m breaststroke.